EverData is hosting my multiple sites and being an online entrepreneur I have more than 10 sites with varying needs. As per my experience with different hosting products and plans EverData is the best choice for various needs like shared hosting, VPS or dedicated server. Right now I am using the new age SEO hosting plan that has actively helped in gearing up my SEO ranks in reasonable time. I am fully satisfied with all the fronts- service, quality, and support! When I first saw Everdata's server prices, I was amazed at how affordable they looked. This lead to a doubt whether they will live up to the expectations and after using it for 5 months, I can say that they definitely have. Being a travel agency, we need to offer a refined user experience across different continents. Since we have joined Everdata Technologies, their plans have helped improve our site performance remarkably. Besides, the well-managed resource allocation allows us to enjoy a fair chance of getting the required resources instantly whenever we need. It has especially been a boon to us during the peak season time when the traffic is way more than the usual days. EverData is an average company. However, if you are a small business owner, they will serve you well. It is tough to come across any better hosting company than Everdata. The features they provide are amazing. Their services are excellent plus the 24/7 customer support is awesome to tackle any type of difficulty. It is really worth spending on their plans. Every hosting company promises 24X7 support but Everdata really delivers. On 31st December last year, our site hung up due to traffic. It was evening there but in India it was 3 AM. We chatted with the Support team and wonder- the y not only answered but resolved the issue urgently. It took hardly few minutes resolve the issue and we were back on the track! They are professional and exactly know how to serve the customers. Thanks Everdata! 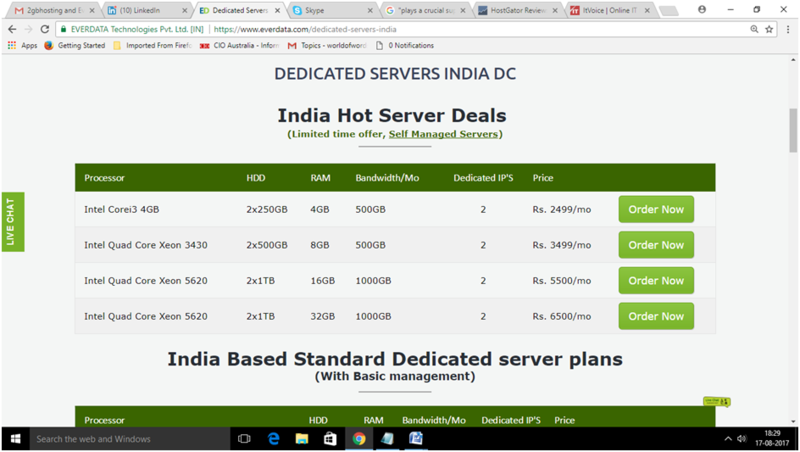 I have a small business in India and I was looking for a shared server and i decided to go with Everdata. They are amazing. Everdata, to me, is above average. It's not perfect for me, but it's doable. Sometimes I face issues like server going offline or slower server speed. However, technical team looks into it as soon as they can. EverData offers supreme quality hosting services at affordable prices while also efficiently helping out the customers with their amazing customer support. It has everything you'd look for when it comes to web hosting. VPS Hosting of the Everdata is amazing. The prices are reasonable and fit under the budget of a small business owner. Also, they have an excellent support team backing up their affairs. Not only VPS Hosting, their shared and dedicated servers are reliable too. Highly recommended to everyone. Everdata Hosting is an underdog hosting company in the market. However, despite their steep reputation, they have one of the best and most active customer care in addition to high time and faster loading speeds at a very low price. We recommend you to give it a try and experience why we rate it so high! EverData is a leading Indian hosting company that is based in India. It provides various kinds of services including Shared, VPS and Dedicated Hosting to users. It is a company that was established as Rajasthan’s first ever privately owned tier 3 level data centre. In addition to this it was the first hosting company to launch the Hindi Cloud. The hosting company has worked hard to ensure that their clients get premium hosting services. Thus, they have enhanced their service levels to such an extent that in loading speed test, they managed to be 35% faster than their competitors. The company also provides free website backups and free website migration to users in addition to a premier customer support. Their seven day money back policy is the biggest proof of their reliability. The upcoming points will cover various aspects of EverData in a detailed manner. The review is based on the actual statistics. Also, we are sharing our experience with EverData because we know that experience matters and it can help people to choose the best hosting services for them. This fact is the reason why we have provided a separate section for users to share their experience. Please share your user expertise in the user's section if you have signed up for EverData in the past. Everdata offers three variants of Linux and Windows shared hosting plans for users. They have a discipline dividing policy that divides the plans as per the targeted audience of the client. These plans are classified as Economic Shared Hosting plan, Business Shared Hosting plan and Enterprise Shared Hosting plan. Why Should You Opt For Everdata Shared Hosting Services? Performance: The features provided by EverData greatly enhance the performance levels of your website. Uptime: The company offers high uptime rate of 99% to users. Control: Users get full control over their specific server. Everdata offers various VPS Hosting packages to users depending on their resources and management requirements. As a matter of fact, it is known that VPS Hosting is one of the fastest growing hosting in the market as of now. Due to the availability of higher resources of Dedicated Hosting at the rate of Shared Hosting is bound to get all the attention away from other hosting services. Why Should You Opt For Everdata VPS Hosting Services? 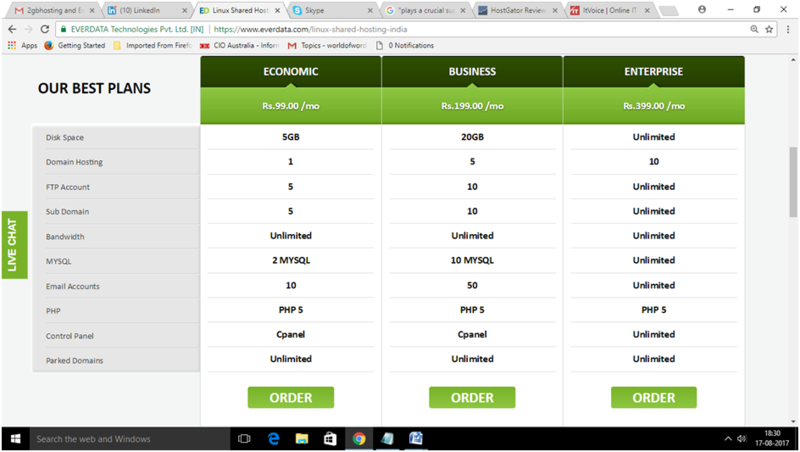 Cheap: Users get features of Dedicated Hosting at the price of Shared Hosting. Single-Click Attributes: The hosting company offers single-click server reboot and single-click installation features to users. Cheap Price: EverData Shared Hosting plans are relatively cheaper but more productive compared to other hosting companies. Why Should You Opt For Everdata Dedicated Hosting Services? Additional Tools: Users are awarded Email Marketing System and SEO Tool Box to elevate their commercial benefits. Everdata Hosting is an Indian web hosting company that is well known for providing premium hosting service to users at reasonable rates. Moreover, it is 35% faster than its competitors and it promises to offer over 99% uptime guarantee to users. The company stays true to their promises and ensure that the performance level of your website never degrades. Everdata Hosting promises to provide over 99% uptime to users with an additional assurance of averting downtime issues at all costs. Fortunately, the companies stays true to their promises and maintains the high uptime commitment. Everdata Hosting is one of the companies in the hosting markets that features an award-winning support. It allows communications via channels like emails, tickets and online chat. Udnerstanding the limitation of languages in various countries, the company offers multilingual support to clients around the world. Everdata Hosting has a fair pricing policy that allows clients to sign up for hosting packages at a very reasonable rate. Their services are best suited for start-ups, small MNCs and SME clients because of the cheap price tag. However, users can personally manage their hosting account and take full advantage of the amazing features provided by Everdata. Everdata Hosting provides many incredible features including a free domain and an exclusive website builder to users. It also has a one-click application installer that will aid you in saving a lot of time during installing applications. The user-friendly cPanel allows efficient management of the website. Moreover, the premium plans of the hosting company are packed with unlimited web space, bandwidth and emails to give more resources to users for enhancing the performance of their website. EverData is a privately owned Tier III level data centre that resides in Jaipur. They were selected as a premier Google Cloud Partner recently as well. The hosting company was founded in 2007. 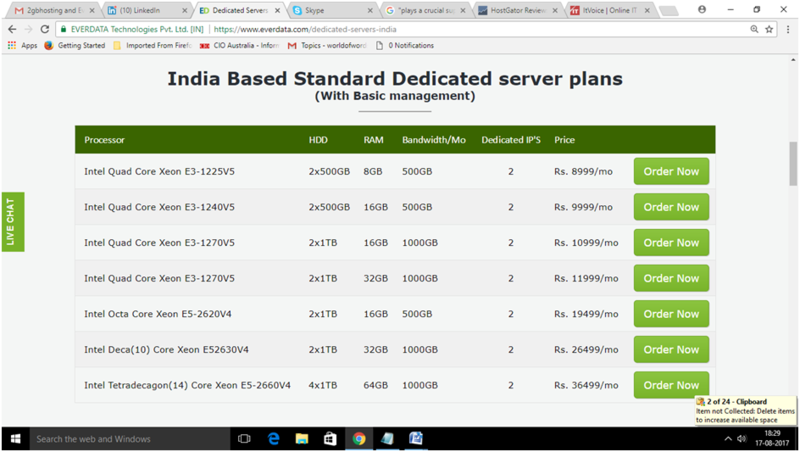 Their datacenter launched the first ever Hindi Cloud in the hosting market. Everdata is one of the most reliable web hosting company that is famous around the web space due to its fair pricing policy and user-friendly ecosystem. It is best suited for start-ups, small MNCs and SMEs because of its reasoble price. The hosting plans of the company are tailor-made for SME sector. In addition to all of these, each of their plans are characterized with user-friendly features that can be easily accessed by novice users as well.